Annual Member Forum – reception announcement! We are thrilled to share an update on our upcoming Annual Member Forum! This year we’re excited to join forces with our friends at Archive-It to co-host a reception that will bring our partner communities together. Join us at the Conservation Pavilion at the National Zoo from 5-7 PM for drinks, hors d’oeuvres, and good times! The Conservation Pavilion is a new building at the National Zoo – so new that it’s yet to have made a print on Google Maps. It is close to the Mane Grill, and represented as #11 on the map here: https://nationalzoo.si.edu/visit/zoo-map. The reception is located central to the conference hotel as well as the member forum site, approximately 1.0 miles between each location. Detailed directions will be provided on the program wiki page. 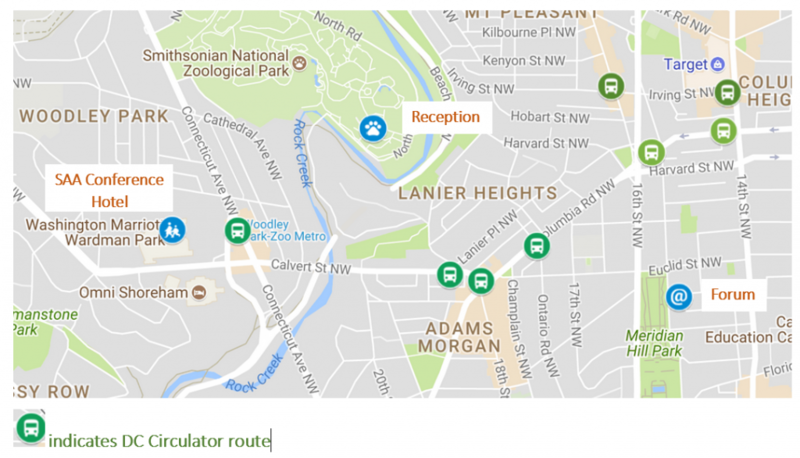 Here is more information on the DC Circulator route. The ArchivesSpace 4th Annual Member Forum will take place on August 14 at the Josephine Butler Parks Center in Washington DC. The planning group continues to accept submissions and topic suggestions! There is a short Google submission form available at https://goo.gl/forms/6L9UsylUz5u2Ws5n1.Proposals, ideas, and suggestions received by June 26 will receive priority consideration. We look forward to seeing you in a couple of months!